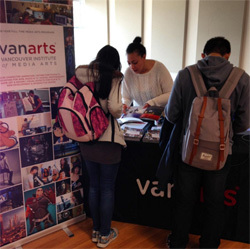 In other news, VanArts was represented well at the Applied Arts Creative Futures Expo in Toronto this week. As reported by our illustrious Program Manager Jeff Bell on-site through Instagram, several of our Photography graduates had their work up for award consideration, including Maylies Lang, Tessa Sheremeta, Blair Browne, and our own Studio Manager Kitt Woodland, who took home the Young AACE Award in Photography! It was great for us to see, and to top it off, our award-winning graduate Reem Abdel-Jabbar, who recently re-located to Toronto, joined our booth to speak with young aspiring artists at the Expo. Congratulations, one and all! You are making VanArts proud! Feeling inspired? Contact our Admissions Team about class audits in photography!